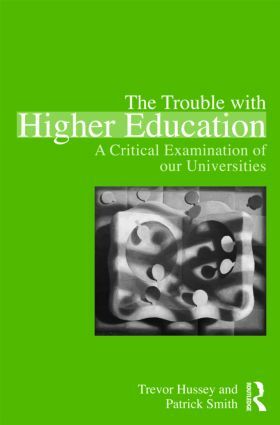 The Trouble with Higher Education is a powerful and topical critique of the Higher Education system in the UK, with relevance to countries with similar systems. Based on the authors’ experiences that span over 30+ years of fieldwork, the issues discussed focus on the problems facing the principle responsibilities of universities: teaching, learning and research. The first half of the book identifies a number of problems that have followed the growth of mass education. It examines their causes and explains their damaging effects. The second half of the book offers a broad vision and makes a number of practical suggestions for ameliorating the problems and improving higher education. Supported by research, the suggestions include: ways of managing universities; proper inspection; better ways of organising students’ learning; improving teaching and learning; better approaches to assessment, and the proper use of ideas such as learning outcomes. Chronic under-funding, the replacement of student grants with loans and the introduction of tuition fees. The emphasis on accountability and decline of trust. The growth of a competitive, market ethos. Modular degrees, knowledge treated as a commodity and students seen as customers. The drift towards a two-tiered system, with teaching colleges and research universities. Casualisation of the academic profession. The Trouble with Higher Education is aimed primarily at a professional audience of academics, educationalists, managers, administrators and policy makers, but would interest anyone concerned about higher education. It is suited to professional development courses, and Master’s and doctoral level studies.